The Pipelined FFT IP Core provides efficient continuous data FFT calculations at the rate of one point per clock cycle. Used in both FPGA and ASIC devices, and excellent for applications where low memory usage is desired. 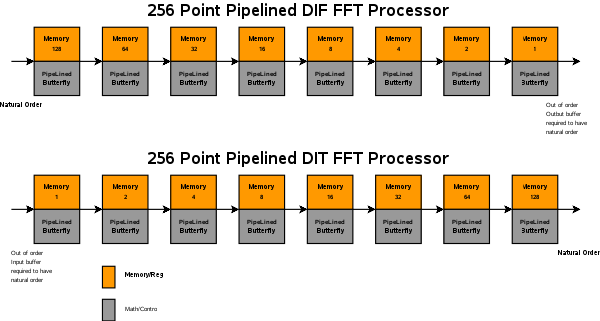 Can result in the least ASIC area usage because of low memory requirement for medium to long FFT lengths. We provide cores for Xilinx and Altera FPGAs (using inferred block RAM and their math IP cores for floating point applications), as well as provide ASIC-targeted or FPGA-to-ASIC roadmap cores (using SRAM wrappers and our own fixed or floating point math cores). Key features of the pipelined FFT IP Core. Decimation-in-Time (DIT) has out of order input, normal order output. Block diagram showing pipelined rank structure with local memories.